Request a Speaker in the Washington, DC metro or outside of the DC metro area. Please note, as of January 15, 2016, the administrative fee has increased. For an event in the DC Metro area, the cost for 1 speaker will be $50 honorarium plus a $25 program fee for a total of $75. We are also instituting a sponsorship program so that organizations with the ability and desire to do so can assist schools with fewer resources in bringing a Faces of Homelessness panel to speak to their students. If your organization is in need of sponsorship, please email us at speakersbureau@nationalhomeless.org. Who are the NCH Speakers? What happens during a Presentation? 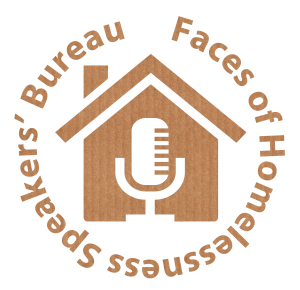 Why should I Attend/Host a “Faces of Homelessness” Speakers Bureau event? Where can I see a “Faces of Homelessness” Speakers’ Bureau event? The “Faces of Homelessness” Speakers' Bureau is comprised of extraordinary people who are committed to sharing their personal and powerful experiences of homelessness with others. From homeless activists to riveting poets, all have found a unique way for their voices to be heard. Donald Whitehead: Donald Hugh Whitehead Jr. is recognized as a leading expert on homelessness, having served as the Executive Director of the National Coalition for the Homeless, Executive Director of the Greater Cincinnati Coalition for the Homeless, Assistant Director at St. Vincent de Paul of Baltimore, Program Director at Ohio Valley Goodwill, Grant Manager at Goodwill of Greater Washington and Director of Communications at Greenpeace Ohio. Donald served two terms as President of the board and currently serves as a member of the Board of Directors for the National Coalition for the Homeless, two terms on the Board of Directors for Faces and Voices of Recovery and two terms on the Georgetown Center for Cultural Competency. Alan Banks: Alan began working with the National Coalition for the Homeless in 2006. Born and raised in the D.C. area, Alan married and entered into the Air Force following his graduation from high school. After his father’s passing in 1996, Alan’s depression led him into a downward spiral. In 2004, Alan found himself homeless. During this time, he lived primarily on the streets. Here, Alan experienced both the best and the worst sides of homelessness, neglect and generosity. He says that many people who ignore homeless people simply “don’t know what to do.” After a brief period of living housed in 2006, Alan was injured as a result of neighborhood violence and became unable to work. He was homeless once again, but he knew where to find services this time. Alan was able to find permanent housing through Friendship Place. Today, Alan works as the Coordinator for Community Engagement at Friendship Place, and he has been reunited with his family. James Davis: Born and raised in Charleston, South Carolina. James began working with the National Coalition for the Homeless in 2003. James earned an Associate’s degree from DeVry Institute in Electronics and Computer Technology. Shortly thereafter, he moved to Greenbelt, Maryland to take a job working on the space shuttle program. A self described workaholic, James later worked for BAE Systems, a job that would take him around the world. Despite his success, the passing of both his parents in a short period of time brought depression and stress upon James. This led to the eventual separation from his wife and his experience with homelessness. He couch surfed with relatives for a while before living outdoors. Hearing the horror stories of shelter life, James was reluctant to seek help. He eventually sought shelter at the Central Union Mission giving him a sense of consistency before finding stable housing in 2007. Dana Woolfolk: A native Washingtonian, Dana was raised in a loving home, but he fell victim to a lifestyle consumed with drugs and alcohol. Dana began working with the National Coalition for the Homeless in 2003. “I grew up in the 60’s and 70’s and in my social circle, recreational drug use was acceptable. Had I known that I would become a full blown addict I would never have tried that first one.” For many years, Dana owned and operated a successful plumbing, heating and electrical contracting company. “After a while, I couldn’t work. I needed to devote all my time and attention to getting and using drugs.” Finally, Dana lost everything including the close ties he had with his family and friends. He ended up living on the streets of D.C. and Northern Virginia for over three years. Dana found help through a rehabilitation program and was eventually placed in transitional housing before buying his own home. After working as a therapist, Dana is currently the Homeless Services/PATH Coordinator for the City of Alexandria. Rachelle Ellison: Rachelle grew up in West Virginia, where she experienced both physical and sexual abuse at the hands of her parents. She was originally diagnosed with Borderline Personality Disorder at the age of 7 and started stealing prescription drugs by the time she was 12. Rachelle moved through mental institutions and foster homes throughout West Virginia before being emancipated from her parents. Rachelle became addicted to cocaine and engaged in prostitution, eventually being diagnosed with bipolar disorder. She continued to struggle with addiction, falling in and out of homelessness as a result of drugs and domestic violence issues. She entered a detox program in 2014 and received her high school diploma at the age of 46. Today she is a Certified Peer Specialist and a qualified medical office administrative assistant. Rachelle joined the Speakers’ Bureau in 2017. “Never underestimate a recovering addict. We fight for our lives everyday in ways most people will never understand”. Chuma Coughman: Chuma, a born and raised DC native attended DC Public Schools throughout. He became homeless at a young age due to abuse and an unstable relationship at home. He found himself couch surfing from place to place for many years. Finally finding stability from an opportunity in 2016 which helped him find a home, among many other great things. Now, this young man his found comfort, a new start of positivity in helping others through the National Coalition for the Homeless, which he joined in 2016. Chuma is currently working on music and writing projects.Writing and supporting stories based off of Homelessness, Mental Illness and the general help of finding ones-self. His Motto of “NEVER GIVE UP” is always a reminder of pushing forward to better yourself. Abdul Ayub: Abdul was born and raised in New York and attended public school until dropping out at the age of 15. He still couldn’t read. He learned to read at the Street Academy in New York and at 19 he moved to DC. Homeless and having no job experience he became a street vendor. He was good at that and sales were good and rewarding. So rewarding that he started using drugs and had no time to vend.Drugs came first. After years of homelessness and abusing himself using drugs he sought help and turned his life around. First was finding a good place to live. He received his GED in 2014 and joined the National Coalition for the Homeless in 2017. He’s so happy to have joined NCH as he’s afforded the opportunity to give back and to always remember where he came from. Having become very interested in the Chinese people and their culture, Abdul has made and continues to travel to China. Now, not only does Abdul speak Chinese, he teaches English to Chinese immigrants and also teaches Tai’Chi. Pamela Reese: Pamela was born and raised in Washington DC. Both of her parents were addicted to drugs. There was a lot of abuse in the household. Pam started using drugs at 13 yrs. old. By the age of 15, she was homeless, moving from house to house, being neglected and abused. She started sleeping in abandoned buildings and/or on rooftops. Although addicted to drugs and homeless, she had two kids and moved to North Carolina. Things were good for a while, but again, she became homeless. Sleeping with her kids in a crack house and weighing 98 lbs. In seeking help for her addiction, she found out that she had been suffering from a mental illness for years and was able to get help. Today, she has 26 yrs. clean and continues to get help for her mental illness. She has been able to adopt two children with disabilities and have a beautiful relationship with her birth children. Roderick Bryant: Roderick grew up in the state of Maryland in a well to do two parent household. He began drinking and experimenting with drugs at 15. By 17 his parents had separated and eventually divorced. Roderick was an aspiring athlete with dreams of playing in the NFL. Depressed over the breakup of his parents, drinking went to another level and he was put out of school for drinking. He joined the Army at 18. It wasn’t long before his drinking got him in trouble and he was court-martialed and incarcerated. Upon his release and realizing his love for cooking he went to school and became a professional chef. “I love cooking! I really do! I enjoy putting the plate together, being creative with it, knowing that somebody I don’t know from a can of paint ‘bout to enjoy this meal I’m putting together. That in itself is just heartwarming”. Being a chef became his hobby. Drinking, drugging and hustling was his job. As a result, Roderick was spent over 20 yrs. incarcerated, where he got his GED. Couch surfing and sleeping in cars is all too familiar to Roderick. He is currently working on getting his life on track. Roderick joined the Speakers’ Bureau in June 2018.
company. Kelvin and his wife of 15 years currently reside in Washington, DC. Candi Darley: Candi was born in Colon’ Panama and raised in Washington DC. Graduated from the Duke Ellington School of the Arts before moving on to graduate from George Washington University. Married into an abusive relationship at 26 to a military man. Acquired fibromyalgia and became ill. After her divorce while dealing with her illness, Candi became homeless. Candi now and has been is a Speaker/Advocate with the National Coalition for the Homeless since 2010. Afterwards, the panelists will offer ways for people to get involved, from volunteering at shelters to influencing legislation. While we do follow a standard format, we are very flexible to fit the needs of the group. Since 1999, the DC-based Speakers' Bureau has given over over 3,000 presentations, speaking to over 50,000 people. Putting a human face on homelessness. Creating better understanding on a very difficult and complex problem one person at a time. Challenging the myths of homelessness with the actual realities of homelessness. Promoting, supporting, and facilitating dialogue between housed and homeless Americans to effectively address this growing problem. Building public awareness of homelessness on a local and national level. This unique and necessary approach to addressing homelessness establishes a significant platform for those whom homelessness affects directly to talk personally about their experiences while advocating for themselves and others. Ultimately, The Faces of Homelessness Speakers’ Bureau seeks to build bridges with the rest of society so that we may work cooperatively to end this disgrace called homelessness. The National Coalition for the Homeless’ “Faces of Homelessness” Speakers’ Bureau conducts presentations at schools, places of worship, conferences, for-profit businesses, non-profit organizations, and special events both in and out of the Greater Washington DC metropolitan area. If you are interested in bringing the Faces of Homelessness Panel to your school or organization, please fill out a request form for the Washington, DC area or to bring the Bureau to your location outside of the DC-Metro area. Once NCH receives your event form, a staff member will follow up with you to confirm that we are available at the date and time you have requested. Each $75 donation will bring a speaker to a school or organization that cannot otherwise afford to set up their own Faces of Homelessness presentation. Utilize our donation button and write "sponsorship program" on the online form. If you forward the receipt for your donation to speakersbureau@nationalhomeless.org, along with a mailing address, NCH will send you a Faces of Homelessness Speakers' Bureau 20th Anniversary poster! Have you attended a presentation? If so, please let us know what you thought by taking this quick survey. Don't forget to like NCH on Facebook!